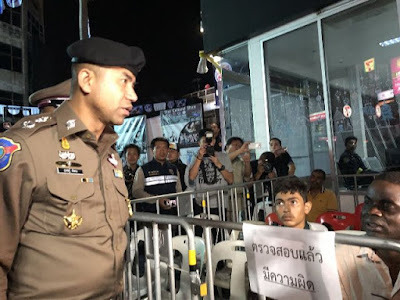 Tourist police joined forces with other police agencies nationwide to search 123 spots around the country and arrested 81 foreigners on several charges. The results of the 7th X-Ray Outlaw Foreigner operation, which was carried out throughout Wednesday till late night, were announced at a press conference by Pol Maj-General Surachet Hakpal, deputy police chief, at Chana Songkram Police Station at 1am. Surachet said 13 foreigners were arrested for overstaying their visas. They included four Laotians, three Indians, two Vietnamese, two Nigerians, one Cambodian and one Malaysian. He said 62 foreigners – 25 Laotians, 24 from Myanmar, four Indians, four Cambodians, two Vietnamese, one Pakistani, and one Liberian – were arrested on charges of unlawful entry into the Kingdom. Six others – four Indians, one from Myanmar and one Nigerian – were arrested on other charges, Surachet added. During the operations, police searched 11 international schools, 21 language institutes, 55 normal schools and other places. Surachet threatened to take action against schools that hired foreign teachers whose visas has expired.